This post is by MSU postdoc Travis Hagey. Late in 2015 BEACON advertised for an Evolution Outreach and Education postdoctoral fellowship. As a result of that posting, we would like to introduce three new postdocs, Dr. Wendy Smythe, Dr. Travis Hagey, and Dr. Alexa Warwick. These new BEACONites will be focusing on diversity outreach (Wendy), communicating BEACON’s research to the public (Travis) and evolution education and outreach (Alexa). We encourage the BEACON community to reach out and strike up new collaborations, taking advantage of the skills and resources these new postdocs bring. Dr. Hagey studying the ecomorphology of Anolis lizards in the Dominican Republic. To introduce these new postdocs to the BEACON community, we will be featuring blog posts dedicated to each of their goals and research interests. Today we are focusing on Dr. Hagey. 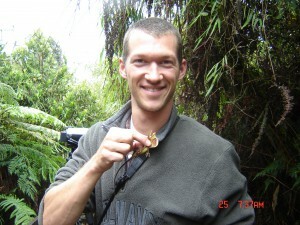 Travis completed his Ph.D. with Dr. Luke Harmon at the University of Idaho in 2013 investigating the evolution, mechanics, and ecology of gecko adhesion (Fig. 1). Travis continued his gecko research at UI for two years as a BEACON funded postdoc As BEACON’s Science Communication Fellow, Travis will be taking over the public communication aspects of BEACON, including the BEACON blog. As result, all blog related inquiries should be directed his way. Travis will also soon be looking for additional blog posts, so if you haven’t ever written one or it has been a while since your last update, take this opportunity to get your research out into the hands of the public. Travis will also be managing BEACON’s Facebook, Twitter, and yearly newsletter. If you have research, upcoming events, or other information that you think should be featured, please let him know. Public science outreach and communication is an important part of science research. It’s also important to BEACON and NSF. If you have been thinking about public science outreach activities or have one come coming up, let Travis know and he can help get the word out. In addition to disseminating the research occurring at BEACON, Travis will also be collaborating with Jory Weintraub on the Sixth Annual Evolution Film Festival Video Contest. The application deadline to submit your short evolution-themed films is coming up at the end of May! Finalists will be screened at the Evolution 2016 conference. Travis will also be continuing his previous research working with gecko adhesion. This research blends evolution, mechanical engineering, and ecology. The main questions of Travis’ research focus on how animal performance works and why animals are shaped the way they’re shaped. This research combines work with live animals, biomechanical simulations, and (if he’s lucky) fieldwork to observe animals using their natural habitat. A 3D reconstruction of Gekko gecko adhesive structures using micro X-ray CT.
Travis is currently investigating the use of high-resolution 3D reconstructions of morphological structures using a suite of different approaches (Fig. 2, confocal microscopy, micro and nano X-ray CT, and photogrammetry). Travis is also working with engineering simulation approaches such as finite element analyses and combining evolutionary and mechanical simulations in software like Open Dynamics Engine. Whenever you mention 3D reconstructions you also have to consider 3D printing! How cool would giant 3D printed gecko toes be? Travis also has experience with evolutionary comparative methods, fitting models of trait evolution such as Brownian Motion and the Ornstein-Uhlenbeck models. If you’ve got questions, are interested in collaboration, or want to chat about biomechanics let him know.